(Text automatically translated) In the port area of ? ?Nice apartment in quiet street, completely renovated, air-conditioned 60m2 +70 m2 terrace on the 6th floor with elevator, decoration. Exceptional view of Castle Hill, Montborron and mountains, 2 bedrooms with double bed, 1 living room, 1 kitchen fully equipped, easy access from the airport (direct bus), bus lines close to the apartment, shops nearby . 7 minutes walk from the Promenade des Anglais / sea 5 minutes walk old nice. 3 room (s), 2 bedroom (s), Open-plan kitchen, 1 bathroom, 1 separate toilet. Private terrace (70m2), garden, solarium area and dining area. The apartment is a short walk to everywhere with numerous restaurants, grocery stores and bakeries nearby. It is a spacious layout for the area and age but the best part is the immense wrap around terrace which doubles the living space. The interior is a little worn but very comfortable and has everything you need. Will definitely book again. Fabulous apartment, balcony and location! We rented this apartment due to all of the wonderful reviews it had received. The apartment is even better than we had imagined. It has everything you need, is a 15 min. walk to the old town and the beach, a 5 min. walk to the picturesque port and a 15 min. walk to a train station from where you can take trains to the various villages along the Cote d'Azur. There is a large, full service grocery store one block away with a bakery across the street. The apartment is at the end of a very quiet street but a few minutes walk to the action. We loved the balcony so much that we bought take-out Chinese (3 blocks away) and take-out pizza several times so that we could dine outside with a bottle of wine, watching the sunset. Very relaxing at the end of a day traveling to various villages by train or spending the day in NIce and the Old Town. The concierge who lives in the same building is extremely helpful and readily available. I had very good communication with the renter. He was always quick to respond and also very helpful. We stayed for a week and it was simply wonderful! I highly recommend! We have stayed in this lovely apartment a few times now and hope to return again and again. The terrace is amazing with room to sunbathe, eat and just sit gazing at the view which is stunning at night. The ladies who look after the apartment are friendly and very helpful. Highly recommended, wish I could live here! "This is a lovely apartment with the main selling point being the outside balcony. Unfortunately the place needed a more thorough clean (when we sat on the sofa a cloud of dust came out, and it felt slightly sticky, so we had to cover it with some spare sheets) - we had to put crockery and cutlery through the dishwasher again, and also the shower tray didn't drain very well as there was a large hair ball in the plughole... a sure sign it hadn't been cleaned properly) The most disappointing thing was the smell of stale sweat on the outside furniture.... I suspect that everything just had a quick wipe over and nothing more. Other than that it is a nice flat, with useful wifi connection (not mentioned in advert) in an up and coming area (nearly there, but not quite!) and very convenient for all amenities (except the beach). I would recommend to a friend if I knew it had been cleaned properly." "- En ce qui concerne le canapé : un produit K2R a été appliqué car les locataires précédents avaient taché le canapé. Il ne s'agit donc pas de la poussière mais d'un produit de nettoyage. - En ce qui concerne le commentaire sur les cheveux dans la douche : Nous demandons aux locataires qui partent de bien vérifier que la douche soit propre. Nous sommes désolés la personne qui a fait le ménage a du oublier cette fois ci." 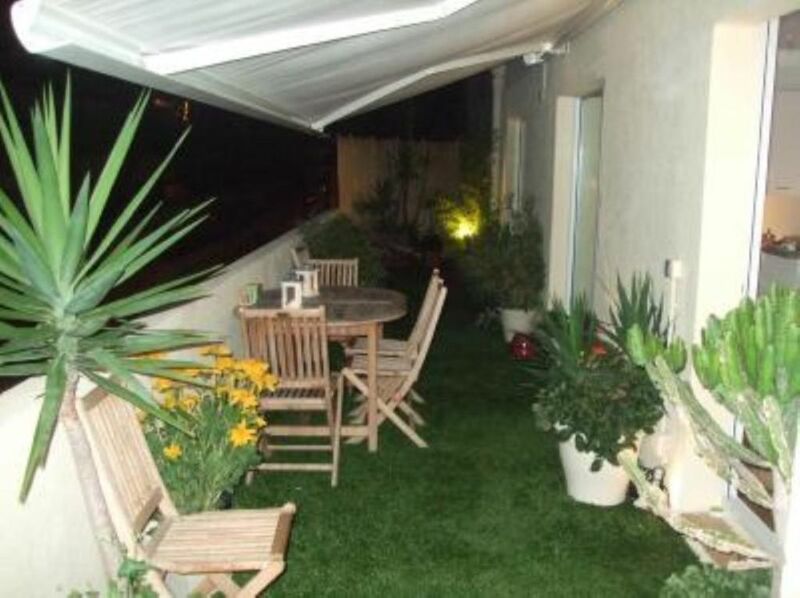 "A bright and comfortable, well equipped apartment with a terrific terrace. The location is excellent, near the Port with a good supermarket almost on the doorstep and great for local transport links. We thoroughly enjoyed our stay and hope to visit again and would recommend without hesitation. The Terrace is so great and even better than the pictures with lots of seating options and just perfect for outdoor dining." "The building appears a bit dark and in need of renovation, but when you enter the flat it stands in clear contrast to the building. The appartement is very bright with big windows and matched the pictures on the webpage completely. Going to bed and looking out on the mountains is amazing. The terrace was also fantastic and possibly even better in real life than as showed on the webpage. The local lady that let us in was extremely helpful with everything - when we locked ourselves out and when the washing machine broke down. All in all a fantastic flat close to the harbour and ten minutes from The Promenade des Anglais. The only thing we missed was some more proper kitchen utensils. A proper knife, some salad bowls etc. was missed as we were there for three weeks and therefore prepared quite a few meals in the kitchen."